¶ Was a Tasmanian eco-activist murdered in 1972? Book, documentary reveal an official reluctance to investigate the death of Brenda Hean. ¶ National Park brochures -- written by literature majors? Immutable yet ever changing, the cliffs of Zion stand resolute, a glowing presence in late day, a wild calm. ¶ Stop the presses! The New York Times discovers beans and oatmeal. ¶ Fancy gated resorts around the West are going bust. Some years ago, I worked part-time for a small Colorado Springs public-relations agency whose head had bailed out of p.r. work in Detroit in the late 1970s. That was prescient of him, given the state of the auto industry today. On the other hand, perhaps Detroit could become a national park for urban explorers. Its four-footed and feathered wildlife is already increasing. Whole neighborhood blocks cleared of houses by arson and bulldozers have reverted to urban prairies, visible in satellite photos as unusually large green patches in the middle of the inner city. Sidewalks vanish beneath creeping grasses, while aluminum fences between homes become entwined with the branches of dozens of saplings growing as high as the droopy utility wires. . . . I encountered [a peregrine falcon] on an upper-floor fire escape of the Book Building a while back. It startled me by squawking loudly at me while perched a few feet away, staring intently at me, long enough to snap a photo of it before it flew off with slow, heavy flaps of its large wings, flying towards the abandoned Fort Shelby Hotel, itself the site of a turkey vulture’s nest this year, sharing roof space with several large trees. UPDATE: I had not realized that a whole blogging genre is evolving around the "lost city" motif. Here is another. The 2009 Lords, Ladies & Gamekeepers calendar is now for sale. Certain Taos literary references come to mind. Ten tips for driving in steep terrain, which I am sure that many of this blog's readers do. Stay Off the Brakes -- When descending a steep slope, the natural reaction is to hit the brakes. Often times this causes the tires to lose traction and the vehicle to slide wherever gravity and fate take it. With a manual transmission, it is easy to use compression braking to hold the vehicle back and keep it from going too fast. With an automatic this is more difficult, but you can still shift the transmission manually into a lower gear. If you do start sliding, point the front tires downhill and accelerate to straighten the vehicle out. It might seem counter-intuitive to hit the gas when you are headed downhill out of control, but this is the best way to regain traction and control. 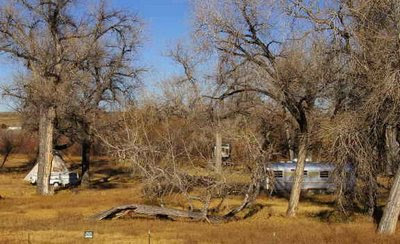 This spot along the Arkansas River near Avondale, Colorado, suggests a North American exhibit in the Museum of Nomadics. It includes, from left, a tipi and a pop-up camping trailer. In the background is a tractor truck (facing away from camera) for the long-haul trucker nomad. Obscured by the fallen tree, center, is a flat-fender Jeep, possibly a Willys MB. (See smaller photo.) And on the right you see a classic aluminum travel trailer. This is the upper Arkansas zone of giant cinnamon rolls and magnificent geological poise. It is mountain-related country, a cusp of things southwestern, Rocky Mountain, and planar. . . . There is something chilling about the piñons and their landscape. They hint of wandering pedestrians, of seed eaters, of Cabeza de Vaca, and perpetual hunger. Early builders of heavier-than-air craft tried to imitate birds, but no human has the chest and back muscles to flap a set of wings. John Orr at Coyote Gulch summarizes speculation about who will be the next Secretary of the Interior, a big item for us Westerners. 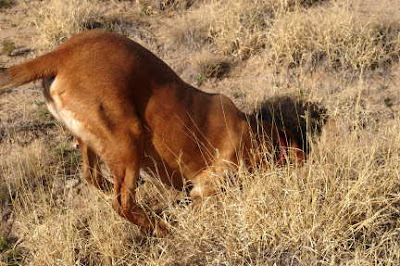 I have seen some blogosphere gossip that the job was offered to New Mexico Gov. Bill Richardson, but I cannot find a link offhand. At least Richardson would know what the Bureau of Indian Affairs and Bureau of Land Management do. But apparently he wanted a foreign-policy job -- Secretary of State -- and not getting that, will take Commerce instead. My friend Ron and I hit a couple of scaled-quail spots on Tuesday afternoon and Wednesday morning. We did not see a one, which makes me wonder if populations were knocked down by the Blizzard of 2006 and are still recovering. We covered a fair amount of ground, and of course the dogs covered more. Jack gave the marching orders and then lapsed into Old Dog Mosey Mode. Ron's Zeke worked hard, though. 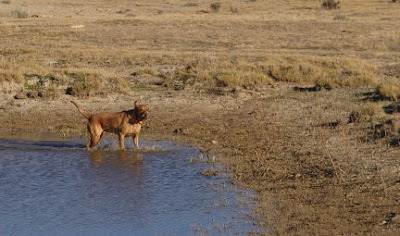 Here he has checked a stock pond for quail. No quail. 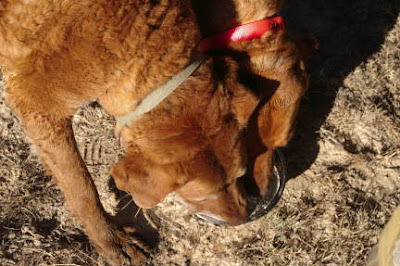 Quail hunting on the Southern Plains is thirsty work. And then there is the cactus. Ow! Settle down, Jack! I will blog about your and Zeke's hunting trip as soon as I have worked on the freelance job that pays money. The weather is unseasonably warm. The price of gasoline is falling. Scaled quail are in season. It's time to go messing around in El Cuartelejo for a couple of days -- although not as far as the settlement of that name. We will postpone any armed incursions into Kansas for a while. I just need a couple of days of big sky, prairie, cactus, canyons, and enigmatic ruins. So does Jack. A shocker: the Branch Inn on Pueblo's Union Avenue exploded this afternoon. (It even had a MySpace page -- what would JoJo have thought?). There were injuries and possibly fatalities. M. was watching Judge Judy when it was interrupted for the news. Her immediate thought was, "What had JoJo been storing in the cellar, left over from the bad old days?" But it will probably turn out to have been a natural-gas explosion. A little piece of "old Pueblo" is gone. M. remembers hanging out in the kitchen with Jo Jo, sampling red sauce on a cold winter afternoon. Costs of the Bureau of Land Management's wild-horse management program are spiraling out of control, reports the Denver Post. Far more horses are just being kept in holding pens than anyone wants to adopt, says the federal General Accounting Office. "The program is at a critical crossroads," the GAO report said. "Within the program's existing budget, BLM cannot afford to care for all the animals off the range, while at the same time manage wild horse and burro populations on the range." There is a program by which state prison inmates care for and break horses, which are later adopted. Everyone loves it -- it's a feel-good news story. When I worked for the Cañon City Daily Record, I wrote a feature about it too. The horses find homes, the inmates have a purpose in their lives, everyone wins. But it places only a fraction of the horses that are rounded up. The simple fact is that the horse-adoption market is finite, and not everyone who wants a horse wants a mustang. The BLM has relied on adoption programs that require people who adopt the animals—protected under the wild horse act—don't sell them for slaughter. 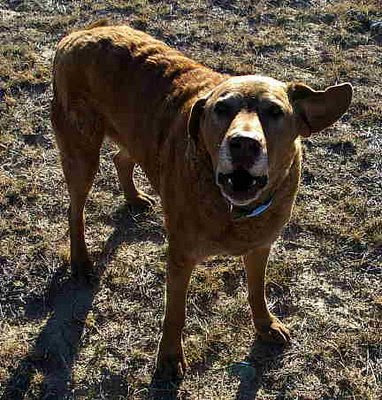 The agency also keeps older animals or those deemed unadoptable in long-term facilities. Some live for 15 to 20 years in the pens. "Since 2001, over 74,000 animals have been removed from the range, while only about 46,600 have been adopted or sold," the report said. UPDATE: BLM tries shuffling money and horses while talks continue. Did It Seem Chilly to You? More confusing climate data. The University of Illinois has a site that lets you compare satellite photos of the Arctic ice cap from one year to the next, going back to 1980. 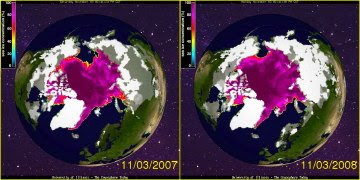 You can see here that there was somewhat more ice cover this year than last, a week ago. On the other hand, in the 1980s the Bering Sea had more ice than this year. The next graphic is about temperatures this year so far, which seems to fit with the above. • Walking in the cities. Walking can do that to you: take you to places you don't expect to go, people you don't expect to meet, entanglements you hadn't planned on. • Michael Pollan (writing before the election) warns the president that food is a big, if somewhat occluded, issue for him to deal with. I have a childhood memory of going on a "nature walk" with someone (in Boy Scouts? at the old Jefferson County, Colo., camp for 6th-graders?) who told us about "smart pills." 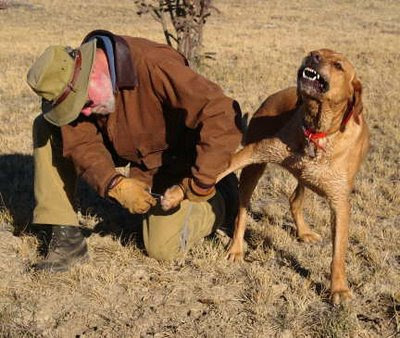 He held up a nearly spherical little mule-deer turd and told us that if we ate one, we would be smart -- smart enough to never do that again! That memory came back when I read this item in today's Denver Post: "Elk Droppings May Have Sickened Kids." Beverly in La Veta blogged on Thursday that "the juncos are back." Here along the southern Colorado foothills, October is the "month of big birds," in other words, jays and such, in terms of traffic at the bird feeders. And then suddenly juncos, pine siskins, and other little guys start appearing -- just in time for Project Feederwatch, which starts today. M. just informed me that two American goldfinches were on the thistle-seed feeder. Ah, something to count! So I was sitting in the bar at the Chicago Hilton Towers last Monday, amid the building "buzz" for the Obama victory rally, when the talk turned to his stand on the Second Amendment. My friend who heads the Women's Studies program at a California university surprised me by telling me that she owned a handgun for protection -- which only goes to show, the typical gun owner is not always who you think s/he is. She said that she hoped President Obama will be "educable" on the issue. Wall Street Journal blogger Keith Johnson notes the poor showing for environmental initiatives in Tuesday's election. I was surprised to come home Wednesday and discover that Colorado's ballot measure to raise severance taxes on oil and gas to something approaching Wyoming's rates (#58) was defeated. The industry-funded campaign falsely cast it as a direct tax at the gas pump, which is so wrong. But their ad guys realized that "it's a tax" was a scary line for a recession election. Only in Missouri did a green-energy ballot initiative have any success. Proposition C set out to gradually increase the use of renewable energy to 15% by 2021, mandating slow-but-steady yearly increases. That’s the kind of measure that power companies and electricity grid operators like, because it gives them time to absorb the new power into the system without disruptions. Alone among the five environmental ballot initiatives, Proposition C had almost no opposition. Not long after writing my "No One Knows How to Cook Anymore" post, I encountered a piece by New York Times writer Tara Parker-Pope on the lure of junk food for poor people. She zig-zags in the lede a little bit, for she writes that " a billion people around the world live on a dollar a day" or less, but then says people in America spend more, only to zig again to an anecdote about a couple of American schoolteachers who indeed tried to live on a dollar a day. This fall a couple in Encinitas, Calif., conducted their own experiment to find out what it was like to live for a month on just a dollar a day for food. Overnight, their diets changed significantly. The budget forced them to give up many store-bought foods and dinners out. Even bread and canned refried beans were too expensive. Instead, the couple — Christopher Greenslate, 28, and Kerri Leonard, 29, both high school social studies teachers — bought raw beans, rice, cornmeal and oatmeal in bulk, and made their own bread and tortillas. And they learned that making these foods takes more time than microwaving something. The slow cooker (Crock-Pot, etc. ), available in many second-hand stores, is the tool you want! Researchers say the experiment reflects many of the challenges that poor people actually face. When food stamps and income checks run low toward the end of the month, they often do scrape by on a dollar a day or less. But many people don’t know how to prepare foods from scratch, or lack the time. I got food stamps twice in my life for short intervals, both times when I was in my twenties and unemployed or part-time employed. I don't think I ever ran out of food, but I ate a lot of split-pea soup and such. Exactly. You have to know. Whose fault is it that you don't? The government's? Mom's? Last year, Dr. Drewnowski led a study, published in The Journal of the American Dietetic Association, comparing the prices of 370 foods sold at supermarkets in the Seattle area. The study showed that “energy dense” junk foods, which pack the most calories and fewest nutrients per gram, were far less expensive than nutrient-rich, lower-calorie foods like fruits and vegetables. The prices of the most healthful foods surged 19.5 percent over the two-year study period, while the junk food prices dropped 1.8 percent. I am not sure what Parker-Pope means here by "energy-dense junk foods." Examples would help. I think of something like french fries, but a raw potato would be cheaper, so what is she talking about? Meanwhile, after a week of restaurant and hotel and Amtrak food, M. and I are back from our Chicago trip. Tonight's supper: soup of red beans, noodles, broccoli, and herbs; home-baked bread, garlic, and olive oil; jug wine. Delicious.